The description you have is incorrect (as is the description by Cresham Carr). The apex of the triangle is actually at the hoist. 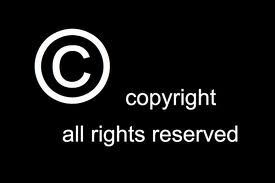 The image needs to be inverted 90 degrees as at the moment it is as if the hoist is on the right hand side inside. I notice that you have a link from a reference to "Klip River Republic" under this heading to the Klipdrift Republic, one of the two diggers' states. Firstly, the Klip River Republic was in the north of the Colony of Natal (as it was before the incorporation of Zululand). It was more or less a remnant of the Republiek van Natalia and was eliminated by the firm establishment of British authority in Durban and Pietermaritzburg, and extending from there to the colony's borders between the Thukela, Buffalo and Mzimkhulu rivers and the Drakensberg mountain range. The burghers either became British subjects or trekked away elsewhere. (This Klip River is a short tributary to the Thukela, lying upriver from Ladysmith. There are other rivers elsewhere in South Africa with the same name). The request for arms and a flag was eventually granted and on 12 January 1856 the King's special envoy, Cornelis Hattingh, arrived in Bloemfontein with the royal gifts. 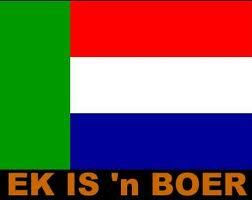 The flag consisted of seven equal alternating horizontal stripes of white and orange with the Dutch flag in the canton. 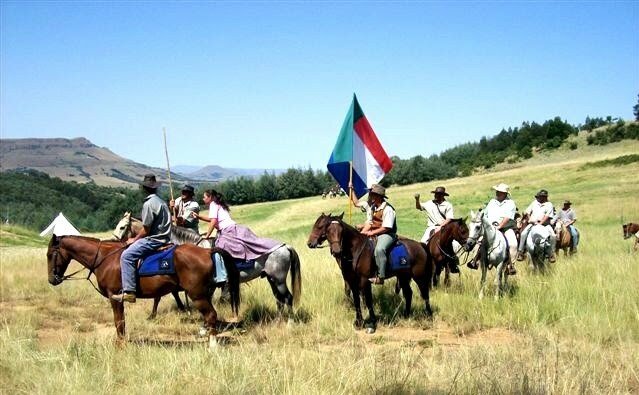 Both the arms and flag remained in use until the OFS came to an end following the signing of the Treaty of Vereeniging marking the end of the Anglo-Boer War on 31 May 1902. The Republic of the Orange Free State then became the British controlled Orange River Colony until it was incorporated into the Union of South Africa on 31 May 1910. The flag of the Orange Free State (OFS) was designed in 1856 by King William III of the Netherlands, on request of the OFS Volksraad (parliament). 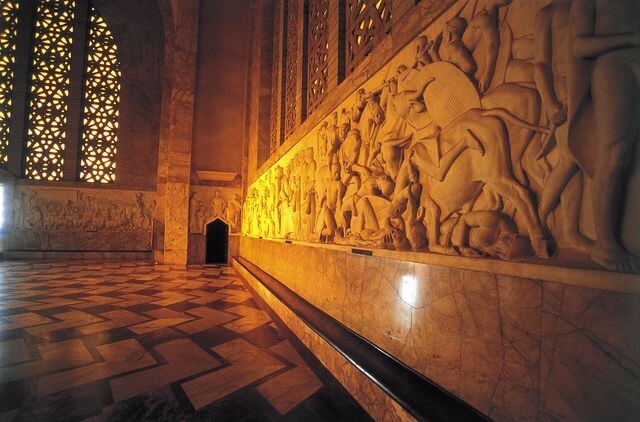 It is said to represent the bonds between the OFS and the Netherlands, and it's royal house (of Orange). Carr goes on to say that some claim the three orange stripes were a reference to William the Third of Orange being the designer. Following the Union of South Africa , that is the joining of the former colonies of Natal, Cape, Transvaal and Orange River on 31 May 1910, South Africa used defaced red and blue ensigns. Having suffered defeat in the Anglo-Boer War (1899-1902), many South Africans particularly of Boer extraction found these flags unacceptable. Discussions about a new flag had taken place from time to time but were interrupted by such pressing issues as World War I and achieving Dominion Status within the British Empire etc. and it was only in 1925 that the matter began to receive renewed attention. The Balfour Declaration adopted at the Imperial Conference of 1926 defined in general terms the mutual constitutional relationship of the self-governing members of the British Empire (later Commonwealth) whereby Great Britain and the dominions were "equal in status, in no way subordinate to one another" and as such South Africa, as an independent state was entitled to a flag of its own. The flag issue in South Africa was also considered along with the question of nationality. 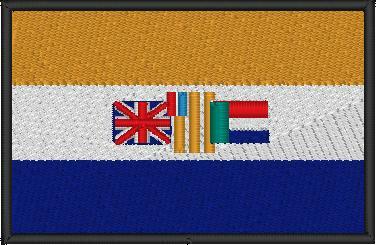 "Three horizontal stripes of equal width from top to bottom, orange, white, blue; in the centre of the white stripe the old Orange Free State Flag hanging vertically, spread in full, with the Union Jack adjoining horizontally, spread in full, towards the pole, and the old Transvaal Vierkleur adjoining horizontally spread in full away from the pole, equidistant from the margins of the white stripe. 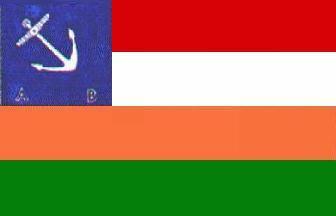 The flags shall be of the same size and their shape shall be proportionally the same as the National Flag and the width of each equal to one-third of the width of the white stripe". This Act came into force on 31 May 1928 when both the new national flag and the Union Jack were hoisted together for the first time at simultaneous ceremonies at the Houses of Parliament in Cape Town and at the Union Buildings in Pretoria. The flags first hoisted at Parliament are now on display in the Old Assembly chamber. 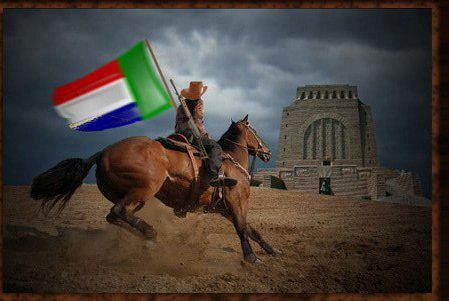 In December 1880 rebellious Boers again declared a South African Republic, which re-established the "Vierkleur". This is the war flag of the former South African Republic (Transvaal), used during the Anglo-Boer War (1899-1902). 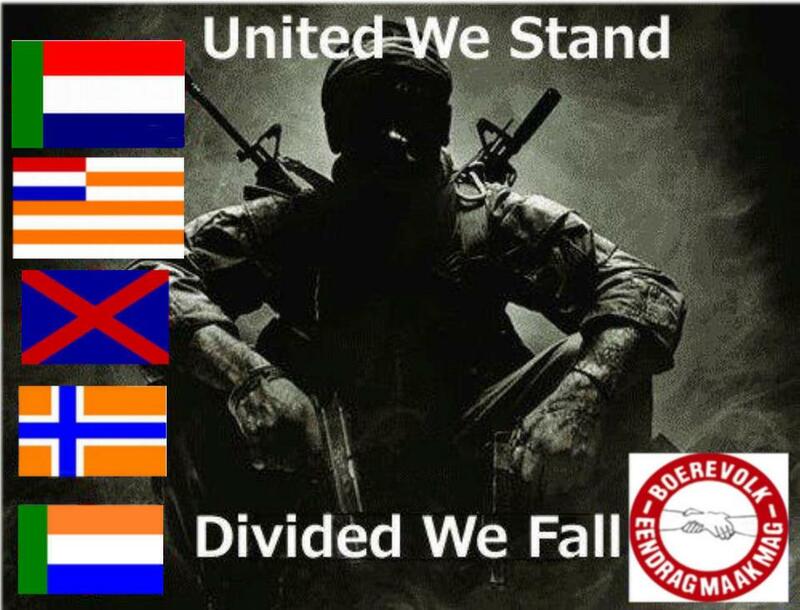 The use of red, white and blue, and indeed of the unadulterated Dutch tricolour Boer flags. 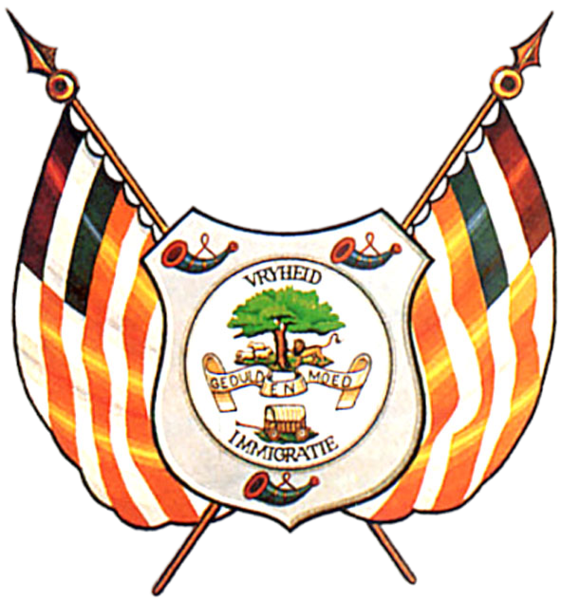 The green stripe in the Transvaal vierkleur is supposed to represent "Young Holland" in 19th century South African and/or the Netherlands.The flag was hoisted for the first time at Potchefstroom. 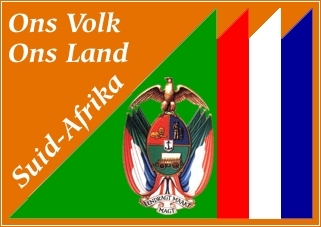 It was officially accepted by the Volksraad (House of Assembly) as the flag of the ZAR on 18 February 1858. Following the occupation by the British, the flag was removed but was raised again on the Day of the Vow (Geloftedag) (16 December) in 1880 in Heidelberg. 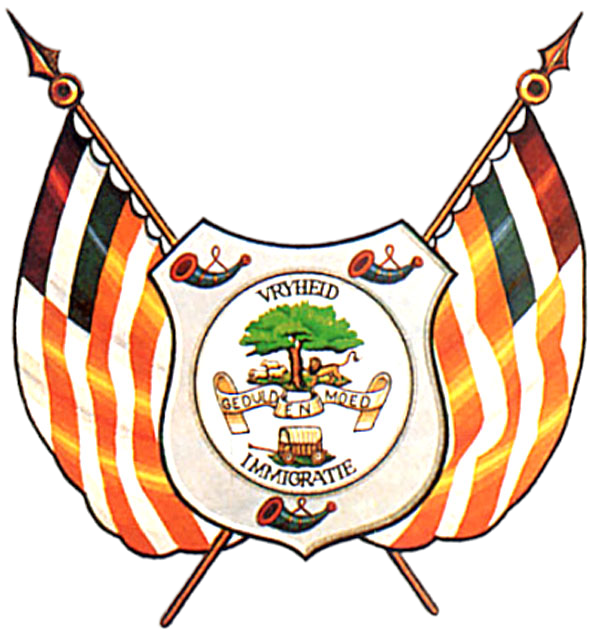 The Transvalers fought under this flag between 1899 and 1902 during the Anglo-Boer War. 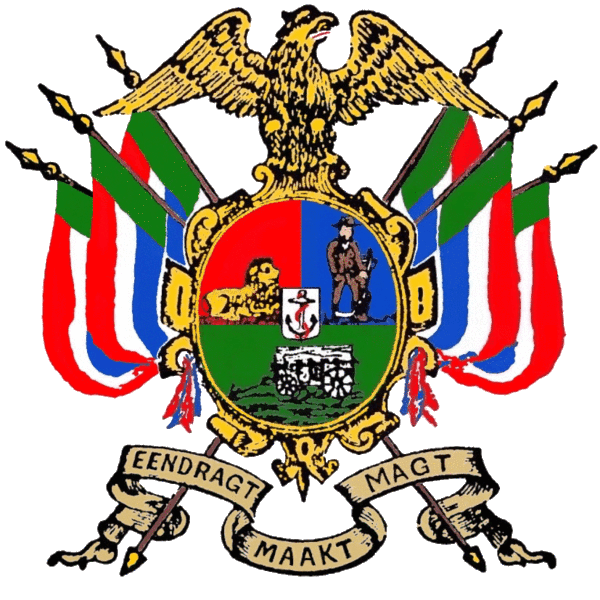 Republic in the Transvaal, formed between 1857 and 1864. 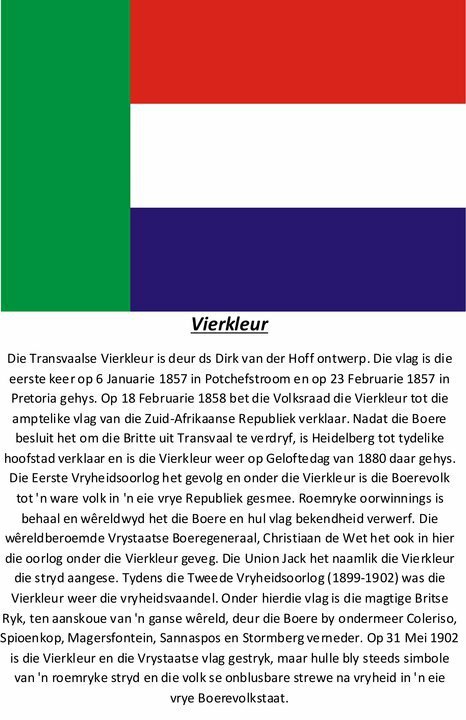 Horizontally red-white-blue with a vertical green stripe at the hoist (known as the "Vierkleur" or four colour) 1857-1902, except for 1874-75 when the Voortrekker flag, but with the saltire fimbriated white, was restored. The new saltire flag was retained as the Presidential flag, but soon fell into abeyance as some felt it was too similar to the Union Jack.The Vierkleur gave way to the Union Jack during the British annexation of the Transvaal between 12 April 1877 and 03 August 1881, following which the independence of the Transvaal was again formally recognised and the Vierkleur restored. 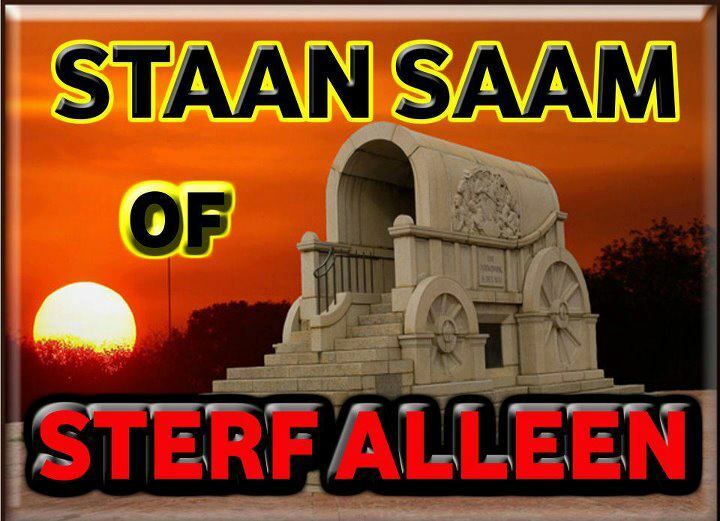 The ZAR came to an end following the Peace of Vereeniging on 31 May 1902 which signaled the end of the Anglo-Boer War and the ZAR once again came under British control as the Transvaal Colony. The flag of the ZAR was incorporated into the new South African flag in 1928 while its arms were retained as the provincial arms of the Transvaal in 1951.This flag was registered with the South African Bureau of Heraldry as the flag of the South African Republic for the Office of the Prime Minister together with the flag of the Republic of Orange Free State on 30 April 1983 (application 08 January 1982, amendment 05 March 1982). Certificates were issued for both in Afrikaans on 14 October 1983. The Vierkleur of the Zuid-Afrikaansche Republiek was designed by Reverend Dirk van der Hoff and was hoisted for the first time in Potchefstroom on 06 January 1857. 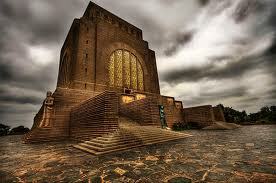 It was officially accepted by the Volksraad (House of Assembly) as the flag of the ZAR on 18 February 1858. Following the occupation by the British, the flag was removed but was raised again on the Day of the Vow (Geloftedag) (16 December) in 1880 in Heidelberg. The Transvalers fought under this flag between 1899 and 1902 during the Anglo-Boer War. According to my 'Allers Illustrerede Konversations-Leksikon', the battle began on 17 and ended on 27 February 1900, when the Boer General Cronje, with 3700 soldiers, surrendered to the British General Roberts. 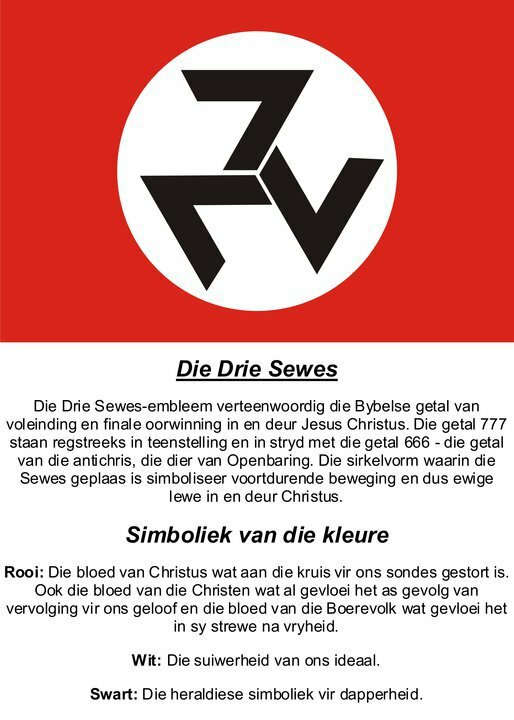 This was the flag of Boere Weersdandsbeweging (BWB) (Boer Resistance Movement in English) which was black with white cross fimbrated red; in the center of the cross is a white circle fimbrated red with three black "7"s. The BWB was initially led by Eddie von Maltitz and subsequently by Andrew Ford. (I don’t know if this organisation still exists). The flag described above (black field with a white cross fimbriated red (George, not Scandinavian); three black upright sevens, one above and two below, on a white disc fimbriated red at the centre) was the original flag of the BWB. A colour photograph of a crowd waving this flag appeared in the Sunday Times, Johannesburg during 1990. When Andrew Ford took over the leadership the flag was replaced by a similar one instead of having the three 7s, bears the letters BWB in white arranged in a triangular fashion (pointing downwards) on a similarly directed black triangle. This seems too focused in Viking book keeping; runes were letters, as such with a lot of usages apart from plain writing down of sound utterances. This rune, turned upside down, is the symbol of the Scottish Independence Party and was used at the elections in Great Britain in 1992. I wonder weather this is more than a coincidence. The saltire-like part of this letter, BTW, is subjected to such a variation that it appears much less evident in some instances. It is also a Swedish twentieth-century graffiti sign conveying a nationalistic message. Not only Swedish, and not even primarily so: the Nazi usage of runes as symbols is known - our site covers it well at naz_symb.html#odal. From there to neo-Nazi symbolism it's a quick jump. 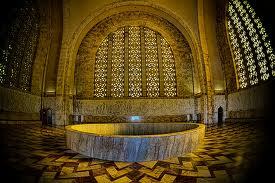 (The referred Swedish usage was reported to the list and appears in se}naz.html). 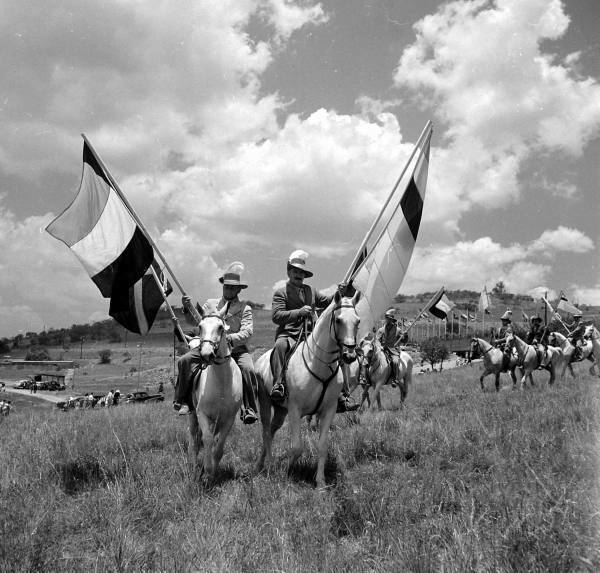 FLAGS THAT WERE MAYBE USED IN THE BOERE WAR ?